Hockey Plumber: Fenway Park to Host NHL Major Announcement! The National Hockey League will make a major announcement concerning a special event Wednesday at 2 pm ET. What suspense! Ha! 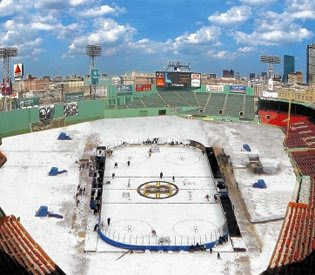 The worst kept secret in sports will officially be "revealed" today that the Boston Bruins will host the next Winter Classic on New Years Day at Fenway Park. The only bit of mystery is the Bruins opponent. The Washington Capitals and Philadelphia Flyers were supposedly the two finalists for the gig, but wouldn't you want a natural, division rival in that spot, say like... the Canadiens if you were a Bruins fan? Here's to hoping its Alexander the Gr8t and the B's on January One. I'll be there either way! Word is the Habs are going to do a game at Olympic Stadium as part of the 100 yr celebration against the Caps, and the Flyers will go to Boston. We debated on my site (Blueshirt Banter) the possibility of a Winter Classic doubleheader, although apparently now that won't happen. I'm all for it, most of my readers were against it, what's your take?